Was born in London in 1835, and educated at Eton and Christchurch, Oxford. He commenced yachting in 1873 with the Lilian, 35 tons, and opened a successful racing career in 1875 with the Flying Cloud, 75-ton schooner. In 1876 he acquired the Vanessa, 20-ton cutter, and he raced her in that and the following year. He then purchased Neva, 60-ton cutter, which he raced in 1878-1879, and the Iris, 120-ton schooner, which he bought in 1879. In 1883 he bought the Gracie, 25-footer, followed by Lil, 25-footer. 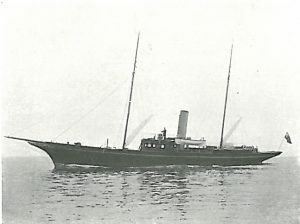 After Lil he acquired the steam yacht Zinaida, 73 tons, followed by the Vista, 95 tons. Belinda, S. Y.. 153 tons. Mr. Fred Cox. He now owns the s.y. Belinda, 173 tons. Mr. Cox’s family are all interested in yacht-racing, and when in 1886 he gave up racing Lil, she was kept in com­mission by his son, and later by his daughters, one of whom is at the present time racing in the Solent classes. He joined the Yacht Racing Association in 1875, and has been a member of the Council since 1886. Besides the Yacht Racing Association, he has shown considerable interest in yacht clubs, and is Commodore of the Royal Southampton and Vice-Commodore of the Castle Yacht Club. Clubs: Royal Thames, Royal Southampton, Castle, Hythe, Island Sailing, Royal Ports­mouth Corinthian, Royal Victoria, Royal Dorset. Residences: 3, Grosvenor Crescent, S.W. ; Harefield Place, Uxbridge; and Stans­wood Cottage, Fawley, Southampton.